Jimmy Fallon may have had a shaky beginning in his hosting career but, since then, everything’s been turning up Jimmy. Thanks to some amazing musical performances and his winning persona, Fallon’s Late Night has been developing a devoted fan base the same way Conan O’Brien’s did back in the day. However, now it looks like he’s actually going to be the heir apparent to another host; Stephen Colbert. No, Fallon’s not going to move to cable. No, he’s not going to speak in character to a Senate Subcommittee on immigration. 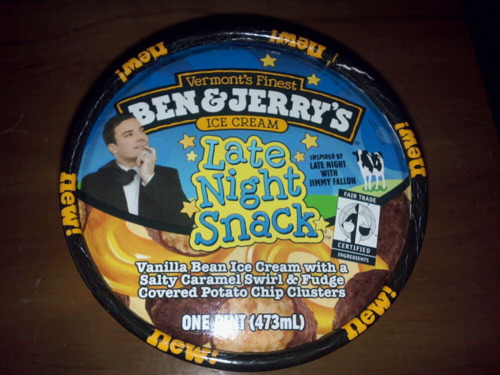 But, if reports are accurate, Fallon is, like Colbert, going to be getting his own Ben & Jerry’s flavor! The flavor has not been officially announced yet but New York Magazine received word that the eponymous Ben and Jerry would be appearing with a “special guest” at 30 Rockefeller Plaza tomorrow, leading them to suspect that an NBC personality would be getting their own ice cream. They guessed Fallon considering his already documented love of the brand and, sure enough, some commenters claimed to have already seen “Late Night Snack” getting a trial run at their grocery stores and pictures soon leaked onto Tumblr. “Vanilla Bean Ice Cream – The flavor is vanilla bean, and there is a difference. If you look closely you will see little flecks of vanilla within the ice cream. I would love the base alone, but it’s made so better with the additions. Salty Caramel Swirl – There is ample amounts of this, as I continued to dig I found even more pockets of goeey, sweet caramel. You can taste the salt, but the sweetness outweighs it. This is a good thing, because you need that sweetness to balance out the saltiness of the next component. While I don’t think “Late Night Snack” is nearly as fun a name as “Americone Dream,” this does sound ridiculously good. We’ll have to wait till the announcement tomorrow to see when it’ll be hitting freezer aisles near us.